School-located influenza vaccination programs led by local health departments could be cost-effective throughout the state of Florida, according to a study published recently in the journal Vaccine. “Our research shows that these programs can be implemented throughout Florida in ways that are not only financially feasible, but will also lead to a decrease in influenza-related mortality among at-risk populations,” said Cuc Tran, Ph.D., a former graduate student in theUniversity of Florida College of Public Health and Health Professions’ department of environmental and global health. As part of her dissertation, Tran analyzed a school-located influenza vaccination program based in Alachua County. Approximately 42 percent of the county’s students from pre-kindergarten through 12th grade participated in that program, which remained financially feasible while serving students both with and without private health insurance. During the 2013-2014 program, 13,815 doses of flu vaccine were administered to Alachua County students. Medicaid-eligible students were able to receive free flu vaccines through Florida’s Vaccines for Children program. One major challenge for the school-located influenza vaccine program is the difference in reimbursement rates for the vaccine depending on who is administering it and who is paying for it. The health department receives just $5 from Medicaid for each dose it administers to school children through the Vaccines for Children program, while private health providers receive $10. The health department receives more than $22 per dose for those children covered by the two major private health insurance carriers in the area. Because of these differences, a school-located flu vaccine program must have enough privately insured students participating in order to cover the costs of vaccinating those students who are either on Medicaid or have no insurance. “School-located vaccination programs are sustainable if they’re run through health departments, but you need to have a certain percentage of children who are privately insured,” said Kathleen Ryan, M.D., a clinical associate professor of pediatrics and infectious diseases in the UF College of Medicine and a faculty member in the Emerging Pathogens Institute. “The program would be even more feasible if the Medicaid reimbursement rate were $10 in communities with a high percentage of students eligible for the VFC vaccine,” said Parker Small, M.D., a professor emeritus of pathology, immunology and laboratory medicine in the UF College of Medicine and a researcher at the Emerging Pathogens Institute. Another complication is the cost of actually administering the vaccine. Although the vaccine itself was free, Alachua County’s school-located flu vaccine program lost $4.68 for each dose administered to Medicaid-enrolled and uninsured children. One of the factors that helped keep those losses down was the use of volunteers to administer the vaccines in Alachua County. Relying on paid employees nearly doubles the cost of the program. Ryan suggests that local health departments may be surprised at the number of people willing to volunteer to help reduce flu incidence in their communities by participating in a school-located flu vaccine program. 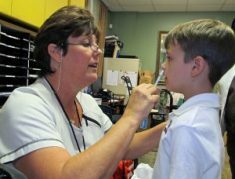 Many counties have nursing schools, for example, that are able to provide volunteers for local health initiatives, and local college students who need community service hours may also want to participate. Parents of school children may also be willing to help, along with employees at the local health department, Ryan added. Tran’s study applied both the fixed and variable costs of running the program in Alachua County across the state and determined that 99 percent of Florida counties could have sustainable programs if they achieve 50 percent vaccination rates and rely on volunteers to administer the vaccinations. According to the Centers for Disease Control and Prevention, unvaccinated children account for 90 percent of all influenza-associated pediatric deaths that occur each year in the United States. The researchers hope that by increasing the number of children who are vaccinated for the flu each year, fewer people at risk of fatal outcomes due to flu infection – including children and the elderly – will come down with the flu. “Sustainability of school-located influenza vaccination programs in Florida,” by Cuc Tran, Ph.D. DOI:http://dx.doi.org/10.1016/j.vaccine.2016.04.017. It appears in Vaccine, Volume 34, Issue 24, Pages 2737 – 2744 (May, 2016) published by Elsevier.